One of our family's regular dishes. Don't forget to use a Kleenex or paper towels. If we don't our pants might get damaged, I wonder if it happens to only my family. It doesn't have anything special, it's just normal Grilled chicken. I think that it's similar to many others in shops. I wonder if it is necessary to make a recipe here. Basic ingredients are the same as Deep-fried marinade chicken. Soy-sauce, salt, Sake, ginger juice and sesame oil, garlic is an option. I think it is better if the taste of soy-sauce is strong. Mix well the seasonings and chicken, and then soak it over night in the refrigerator. That's it. After you prepare dinner, you can also prepare this chicken. The amount of seasoning is about as usual. Usually I don't use Tbsp and tbs for cooking, please do not believe this inaccurate recipe. In the morning, I go straight to the oven toaster and turn on the switch, first of all. (We don't have an oven, we fervently hope to buy a Combec!) Dress myself and then put prepared chicken into the oven deliberately. Time for baking depends on the heating power, for example our oven toaster takes about 15 minutes in "For toast: 950w". Turn over chicken once while baking. And you can have an easy dish which is much more delicious than boring frozen food. But you should not cut baking time, that point is important and different to other dishes. I often tearfully omitted this dish in Atsusi's lunch-box, because of no time for baking. I didn't take the time for baking until he left home first in the mornings. The key of this recipe is the quality of seasonings like Sake, soy-sauce and salt. They must be high quality, especially soy-sauce taste, golden brown soy-sauce is important. 1 piece sliced garlic (optional) * Recently I don't add it. 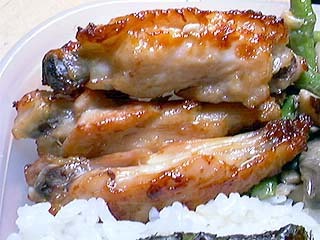 Recently chicken wing tops are getting more popular than chicken wings among us. Chicken wings are also easier to bake than chicken drams. Left picture shows that chicken wings are seasoned. The knock of cooking the dish depends on ginger juice, I think. If you do the preparation at night, just mixing the all ingredients is fine. If you cook this in the morning, it's better to mix the all ingredients except sesame oil well using your hands. And then add sesame oil and mix well again. But I don't think I have enough time for cooking in the busy morning. So it's better to marinate chicken overnight. If you use an oven toaster, bake the chicken on several layers of aluminum foils. If you don't, it's bothersome to clean the oven toaster. Turn over the chicken when the chicken is golden brown. The right picture on the top, it shouldn't turn over yet. The best timing is when you wonder if it is kind of burnt." and wait for 1 minute. I suggest that you measure the baking time once and after that you can bake it easily without worrying about the time. The left picture in the middle, that is the good condition to turn it over. Generally people take it out of the oven before it is well baked, so I suggest you bake it thinking "some burnt is OK". The time for baking is for my family about 7-8 minutes. After turning over the chicken, the baking time becomes short. Well baked chicken is very tasty. And it's better well done than under done. Don't worry about letting it burn.